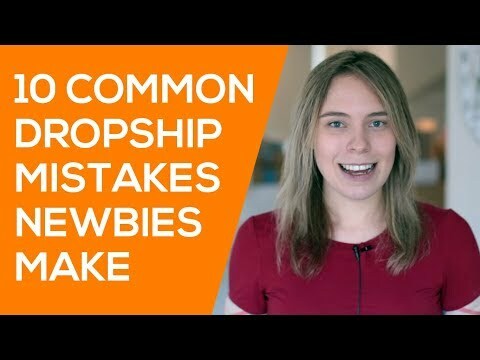 Do these 10 things BEFORE you start dropshipping so that you don’t lose money! #1: Check Shipping Times BEFORE Choosing Which Countries to Sell To. A lot of beginners put “worldwide” shipping on their product listings and ship anywhere because they know that most Aliexpress sellers will ship worldwide. But this doesn’t mean as a beginners that you should do that. Why? Well, because some countries are problematic to ship to. For example – shipping to the UK takes a long time. It will take 20-40 days for an item to arrive. Compare that to ePacket shipping to the USA which is 10-20 days. We strongly recommend as a beginner focusing on countries with shorter shipping times of 2-3 weeks, as this will cause less customer support issues. #2: Create Your Own Store When Dropshipping. DON’T Dropship on eBay or Amazon. A lot of beginners want to do Aliexpress dropshipping on eBay or Amazon because then they can save money and not have to set up a Shopify or Woocommerce store. However, we recommend that you don’t do this as pricing competition is fierce on those websites. Spend the extra money upfront to sell in your own store. A very common question we get asked at Wholesale Ted is whether you NEED to open an LLC before starting a dropshipping store. The answer is that no, you don’t need to. You can sell without any legal paperwork. If you do this, you are by default a sole proprietor. HOWEVER, while you don’t NEED to, it is a good idea to. By setting up an LLC you protect yourself legally in case you get sued. This is especially important for people that live in the USA. But as it costs money to set up an LLC, not everyone will be able to afford this. If you can’t afford it, don’t let it stop you. It is optional. 1) On the product page description (bold this). 2) On the checkout page. 3) In the purchase confirmation email. Set up a refund policy page and note in it that you only accept returns for faulty/broken products. It is also industry standard to require customers ship the item back to you for a refund at their own expense. Include a link to this page in the footer of your store. 1) Remind them about the shipping times of 2-4 weeks that they agreed to when they purchased the item from you. 2) Tell them that if they are having any issues they can always email you. 3) Remind them that they can track their order online, and give them a link to how they can do this. Before you run ads, set up a like campaign and get a few hundred likes to your store’s Facebook fanpage to add authority. Do not get impatient and only add a few products to your store before running ads. This will make your store look illegitimate and you will create mistrust between you and your potential customers as it makes your store look half-finished. Make sure you add lots of products before running ads/tests. When a customer buys an item from you, you will not get that money instantly. PayPal often holds money for up to 3 weeks. And Stripe pays out money weekly. So you need to make sure you have money set aside on a debit card, or have a credit card to purchase items the customer buys from you while you’re waiting for your money to clear. If you plan on running paid Facebook ads, then be prepared to test a lot of products. Don’t run a few tests and then give up if they don’t make you money immediately. Set aside a budget of a few hundred dollars and be willing to spend that while running lots of tests to find your winning products.